The following is a guest post. For the author bio, please see the bottom of the article. Many of the injuries that occur during martial arts training or sparring are not unique to forms of systematized combat training. The potential is there for you to suffer almost all of the same types of knee injuries when involved in just about any other intense physical activity or sport. So if your knee was injured in martial arts, your healing process will be pretty similar to that of a person with the same injury that did not occur during the course of martial arts practice. That will be something you will probably want to to consider while you are recovering and preparing to get back to training. Suffering from a knee injury of any kind is never a fun experience, and these injuries can sometimes have long recovery times. You will want to follow every instruction given to you by your doctor or physical therapist after a trauma to your knee because it is important that your joint heals properly. Due to the complexity of the knee itself, there are numerous parts of your knee that could become injured. Not only are there all of these tendons, bones, ligaments, and cartilage that can get damaged but there are various levels of severity for each type of injury. In the end, your knee is unique to you and so is the way that it heals after getting hurt. In most cases, the time it takes you to recover after trauma can depend heavily on the way your knee was harmed. This can also be dependent on what part or parts of the knee were damaged and how bad the injury was. Also, the amount of time it takes to heal generally increases if surgery was needed to repair any ligaments or tendons inside of your knee. In martial arts, many knee injuries can often come from direct impact to the joint. While knees can sustain a certain amount of impact, not stretching your upper leg, lower leg, and your knee before and after training may reduce the elasticity of the tendons and ligaments of your knee and leg. 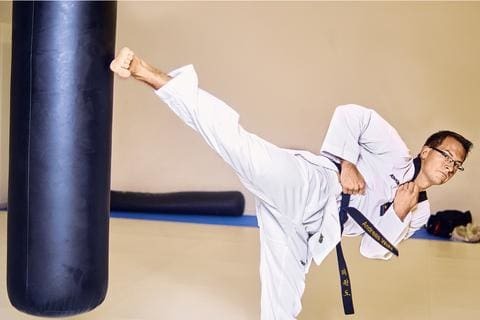 Examples of a direct impact to your knee joint are practicing kicks on a training bag, hard contact during a sparring match when you deliver a blow with your lower leg or knee or sustaining a direct hit to the knee or lower leg. Whether you only had to have your doctor diagnose what was damaged in your knee or you had to have your knee surgically repaired, your physician will have given you some instructions. You will also most likely have a rough idea of what the timeline for your recovery will look like. Once you have made it home there are some things that can help you during this time. Compression could help lower the amount of swelling you experience. There are many different types of compression devices for the knee so depending on what injury you suffered you will most likely want to find the best strategic compression brace for your specific injury. Icing the afflicted area may aid in reducing the level of pain you have to endure, and it can also help decrease inflammation. 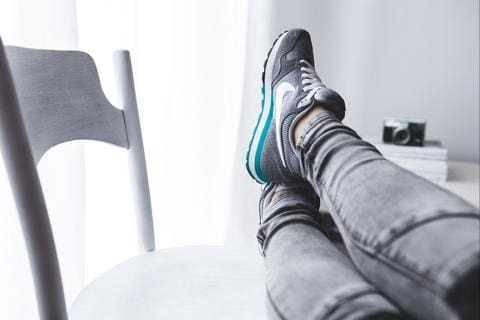 Also, whenever you are sitting down or lying down elevating you injured leg could help with circulation and pain especially overnight or while you are sleeping. After having had an injury you may find yourself itching to get back to training and exercising. It is important to stay active, but also to allow your damaged tissue time to repair itself properly and completely. Jumping back into your pre-injury routine too quickly could cause you to injure a different part of your body, or damage your recovering knee further. The last thing that you probably want to do is to make your recovery period last even longer, and that is what will most likely happen if you try to train too soon. When you have been cleared by your doctor to start training again, one vital point to remember is that you must make sure that you start slow and pace yourself. If you have given yourself the recommended amount of time to heal back to a level of one-hundred percent physical fitness, then you can work your way back to where you were before your injury with optimum performance. With a little patience and the right attitude you just might surpass the level you were at before you got hurt. Keep in mind, you have just endured a knee injury and made your come back! What are you going to do next?